After seeing a couple of posts on social media for Cookie Dough Brownies, I decided to make some myself. 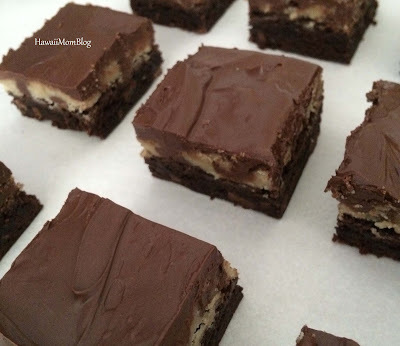 I used this recipe from Recipe Girl for the cookie dough layer, and simply used a boxed mix for the brownie layer. . They turned out super delicious. I originally cut them into squares, but one square was so rich, I ended up cutting them in half. If you love cookie dough and brownies, you need to make these! Prepare the brownie mix and bake according to directions. To make the cookie dough layer, combine the butter, sugars, and salt until creamy. Stir in 1 cup of the chocolate chips. Spread cookie dough onto brownie layer. Melt remaining 1 cup of the chocolate chips in the microwave for 1 minute on high. Stir until smooth (heat for another 30 seconds if necessary). Spread chocolate onto cookie dough layer.